From 1972 to 1985, I was known not as a guitarist or singer, but as an old-time fiddler. There’s a whole swath of people around the US and in Ireland and France who would marvel that I am a blues and slide guitarist and singer. By the same token, there are many fans and friends who have no idea that I play Old-Time fiddle and clawhammer banjo. Having learned the sound and tunes at the hands of the old people, I am a good southern Old-Time fiddler. And I have taught fiddle at one or two music camps over the last 25 years, and played the dances when needed. This is handed knowledge that was passed on to me from people who were born in the late 19th and early 20th Centuries. It’s important to me to pass that on. So, in addition to roots and blues guitar,clawhammer banjo, and voice lessons, I offer Old-Time fiddle lessons, as well. Contact me through the site here to see if that would be useful to you. I’m a good diagnostician and a good teacher. 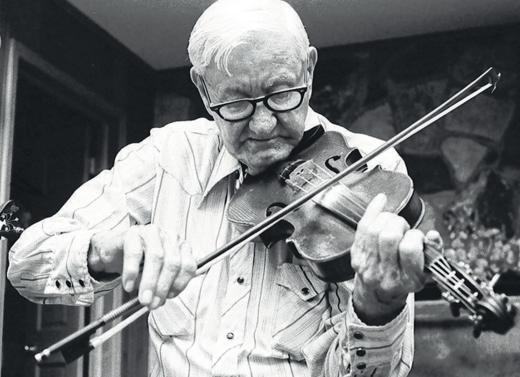 By the early fall of 1972, I’d played in enough Old-Time sessions to see how much fun a fiddle could be. Fiddlers moved as they played, sometimes their whole bodies would be in motion: feet, legs, arms, torso. While I’d been trapped behind a guitar or a banjo, the fiddlers were fairly well dancing to the tunes they were playing. I thought the fiddle was the thing. So, during a break in a Sunday afternoon session, I asked if I could borrow Chris Murray’s fiddle for a minute and took it out into the back yard. I puzzled over it, plucked out a scale, then found a tune (an approximation of Uncle Bunt Stevens’ Sail Away Ladies, as I later realized, in the wrong key). Oh, I dragged the bow across the strings. I scraped out a melody. About 15 minutes was enough for me. I’d made up my mind. “I could play one of these,” I thought, and went back inside. About a month later, I bought a fiddle from Freddy Goodhart’s second hand shop on Jefferson Street. Two months after that, Odell McGuire and I went down to visit Tommy Jefferson Jarrell in Toast NC, near Mount Airy. Tommy greeted us at the door and waved us in. We were going to sleep over with him Saturday night and go home Sunday. “Come in! Come in!” Tommy fairly shouted. He seemed delighted to have us in the house. “No. You boys play me something first,” he replied. So, Odell got out his banjo and I got out my fiddle, which I’d been playing for about six weeks and we struggled through one of the three or four tunes I’d managed to find on the damned thing. When we got done with the tune, being indulgent of new fiddlers, Tommy said, “Now, that’s pretty good. That’s pretty good.” Then he turned to me. And he did. Tommy was as fine a teacher as he was a musician. He knew what he was doing and why he was doing it. And he could tell you so. He’d stop and point out how he’d work his bowing around, repeating a note if necessary, to get the bow in the position he wanted it. He played ‘Drunken Hiccups’ to demonstrate how one time through the second part the bow was going down and the second time through it was going up, in preparation for the strong beats at the top of the return to the first part. It was a revelation. That was my first lesson in playing Old-Time fiddle. I went home and unlearned everything I’d managed to figure out. I took some violin lessons to learn how to hold the thing, how the bow was supposed to work, and get some basics in place. I played scales and printed music for the lessons, struggling to get the bow and my bowing hand and arm to behave. It was valuable to me. But, it was Tommy who set me on the right path, and not just for fiddling. He gave me an understanding of just how physical making music really is. I have paid attention to how to use the body ever since.